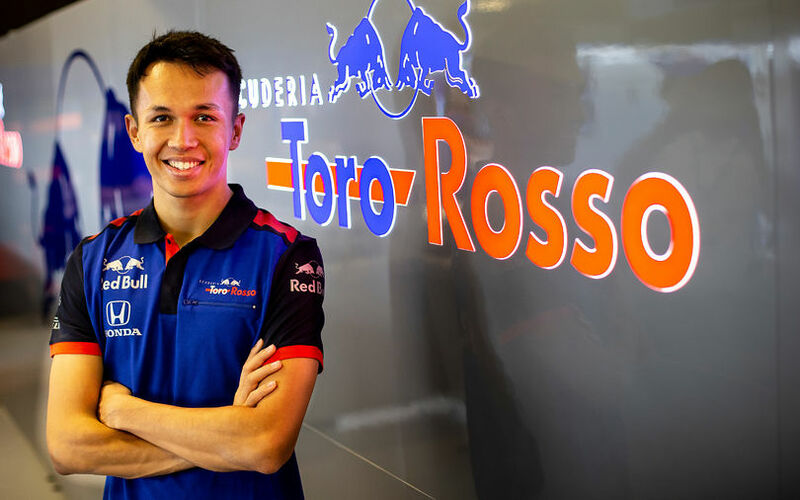 Scuderia Toro Rosso has announced that Alexander Albon will drive for the team in the 2019 Formula 1 season, alongside Daniil Kvyat. The 22-year-old British/Thai finished third in the Formula 2 Championship this year, having been in the running for overall victory until the final race. Ocon and Russel would be a fantastic line-up for Williams, unfortunately the team needs money, Sirotkin has $15m a year sponsorship and Mazepin is eyeing an F1 seat with enough backing that his father was competing with Lawrence Stroll to buy out Force India. I can see Toto being able to swing one seat, but two is very unlikely. I think Toto and Mercedes should pay Williams to take on both Ocon and Russell. But I do understand having four drivers on the grid will be a major distraction for Toto. I'm sure Ocon and Russell are mature enough, but I think Niki can play a bigger role in coaching Ocon and Russell like Jochen Neerpasch or Jochen Mass did for Schumacher/Wendlinger/Frentzen. The first priority is getting Ocon a seat in F1 with a friendly team for Mercedes I think, Williams seems to be an obvious choice and good for the grid. Then Ocon can replace Bottas the year after and Ocon is in a good position if or when Hamilton retires (from Mercedes). Russel can then take the open spot at Williams and possibly move up for the vacant seat at Mercedes in 2021 or somewhere. I know it looks bad for Ocon and Wehrlein hasn't been the best example, but so far, Mercedes likes to put their own talent in their cars, don't forget, when they joined F1 all the way back in 94 or something, the first thing they did was to put Wendlinger in the Sauber and at their return in 2010 there were three old Mercedes juniors at the team (Heidfeld, Rosberg en Schumacher) and Hamilton is from their program as well. I remember when Alberts was part of their program and one of the consultancy jobs I had was with one of his sponsors from the junior classes. When he became second in DTM and he got an offer to drive F1, Haug sat him down: if you stay with Mercedes we'll make sure you'll get a good career, with a good possibility of F1, if you leave now, we're done. Mercedes looks further away then next season, Ocon has to be patient. His time will come for sure. Gutted for Ocon, especially if you judge this in the context of his interview for Beyond the Grid. Long story short, his family had to make huge sacrifices to keep him racing (sell house and move in a caravan type), then when he was F3 champion he didn't have a seat until very very late in the winter break. With this in mind, he said now he's the most relaxed he's ever been in his career, knowing (foolishly in hindsight) that F1 is about meritocracy and, as long as he performs, he won't be overlooked. Wasn't that impressed with Wehrlein tbh and Russel can have a season as a test driver. I still can't understand why they can't get Ocon in the Williams and who's so desperate that they'd take Stroll's. HE should have found some french backers. You can't be too complacent in this time in formula 1. See Checo Perez, a proactive sort of driver. Checo is the first Mexican driver since how long? Ocon is just another French driver (for now). We, fans, know he's great, but for the average Jacques, until he wins a title or at least a few wins, he's just a Grosjean. From the same interview, they do come across as simple people, not the business-type, so probably that, coupled with the first point, makes it that much harder to get sponsorship. I wouldnt be sure either Ocon or Russel would be better than Bottas either. As long as they dont drive the same car, who’s to know for sure? There was no French Grand Prix for about a decade, getting French backers would have been a very hard task, as they don't seem keen on the sport. Even Total pulled out recently, before that, Elf did the same in the late 90's. The Mercedes management I guess. Sim data and data from tests and the team they are driving for. Besides that, maybe more then their current performance, their learning curve is most important anyway. How fast are they going to be in an x amount of time. The nicest thing you can say about Bottas is he's solid, even when compared to other "number 2" drivers he's just lacking. Look at drivers like Webber and Rosberg, the former almost won a WDC and had some very memorable wins. The latter actually won a WDC and again had some very memorable races. I guess the point I'm trying to make is that Bottas just seems to lack that fire that made Webber and Rosberg so interesting to watch, even when they were being beaten by their team mates, they didn't give up and fought hard. Mercedes should give the second seat to Ocon so they have a genuine successor for Hamilton when he retires. OR.. when Hamilton moves to Ferrari. Rosberg was never a number 2 ?! From a talent perspective, both were number 2 drivers despite not being in true support roles, like say Rubens was at Ferrari for Shuey. Whats a true support role , letting your team mate win when you deserve the win ? Did you not watch the Shuey era at Ferrari? The FIA even banned team orders after one notorious incident (with Massa iirc). Whats a true supporta role , letting your team mate win when you deserve the win ? I read your post as if you were saying Rubens wasnt in a true support role , so my reply was a little sarcastic, my bad.